Mooi ingerichte met drie slaapkamers twee badkamers Greenhill Condo. Het appartement bevindt zich op de tweede verdieping van het gebouw. Een ruime volledig ingerichte keuken opent naar de woonkamer. De eetkamer bevindt zich naast de keuken en biedt plaats aan 6 personen. Master en gastenkamers zijn gescheiden door een comfortabele woonkamer. Slaapkamer heeft een queensize bed en een eigen complete badkamer. Gasten kamers hebben ook queensize bedden en delen een ligbad. Het dek bevindt zich naast de woonkamer. Het appartement van Meadowview heeft draadloos internet en kabeltelevisie in de woonkamer. Toplocatie in het centrum van Boone. 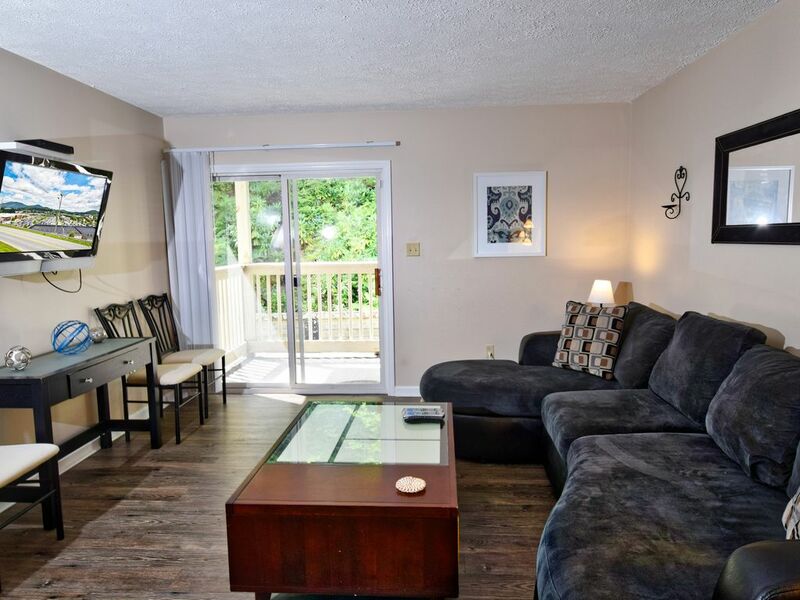 This 3 bedroom condo had a great location. We only used two bedrooms. The unit was very clean. The lock box was just as described. I did try and contact the realty company just to let them know of kitchen ceiling damage from the unit above. The light fixture had held water and the ceiling was damaged. It was not wet but the owner should look at it and have repairs done. I sent the company a picture so they could let the owner know. It did not affect our stay at all. The realty company also had agreed to waive the pet fee since we don’t have a pet but it was charged on my credit card. I am still hopeful that they will refund the $59. The fees essentially doubled the cost of rent for our four night stay. A nice place to stay with plentiful parking. Thank you for sharing your condo. Thank you for bringing the the light fixture to our attention, this has since been addressed with our maintenance department. Also we checked and the pet fee was removed from the reservation. Thank you, again and we look forward to hosting you again. Property is in great location and was very clean. Could use a few fixes like closet doors that don't close properly and better lighting. Overall it was a very good value for the money and we would stay there again when visiting relatives in Boone. Excellent location, comfy beds, well stocked kitchen. This unit was very comfortable and had everything we needed. The location was perfect and area was quiet. We had an issue with programmed thermostat and didn’t sleep the first night. Went to 75 degrees several times during the night. The heat woke us up several times where we had to turn it back down. In the morning figured out and deleted the programming. Master bedroom could use a curtain to keep out parking lot lights and bathrooms could use rugs or bath mats. Other than that the place was great and we would stay again.